New Delhi: The inflation is still high due to external factors, but prices can be tamed if manufacturing costs are brought down by increasing productivity, said K.C. 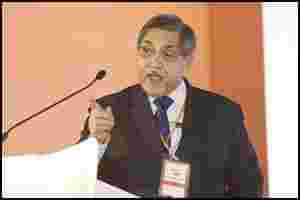 Chakrabarty, a deputy governor at the Reserve Bank of India (RBI) on Friday. The figure was almost in line with the median forecast for a 9.70% rise in a Reuters poll and was lower than the annual rise of 9.78% in August. The WPI is more closely watched than the consumer price index (CPI) in India as it covers a higher number of products. The RBI, which will meet on 25 October to review policy, has raised interest rates a dozen times since March 2010 to combat stubbornly high inflation and is expected to tighten them further one last time this year before a pause. The benchmark 10-year bond yield was at 8.78%, after easing 1 basis point to 8.77% immediately after the data. The benchmark five-year swap rate eased 2 basis points to 7.44% and the one-year rate dipped 3 bps to 8.13% from beforehand. The 30-share BSE index extended rise to 0.6% from 0.5%. The partially convertible rupee strengthented to 49.05 per dollar from 49.10 earlier. “No surprises, the numbers are in line with expectations. Manufacturing inflation is moderating but it is still rising sequentially. Coupled with the rebound in oil prices, this reading should seal the case for a 25 basis points rate hike in the October review." “The inflation number was in line with expectations, but higher than RBI’s current comfort zone. The market will likely price in that RBI will hike rates but the revisions offer comfort though as July has been revised by only 14 bps compared to average of 80 bps in the last 6 months." “The September number suggests that core inflation is also quite sticky and are coming from increases in food and fuel prices. The broader inflation index seems to have attained a new normal. “However, because of the changes in the global and domestic economic conditions I feel the scope for further rate hikes appears to be limited, as even if RBI raises rates, the pass through may not happen as banks do not have much scope to do that. “The RBI may have to wait till early December, when the statistical base effects kick in and inflation likely will also start showing signs of some moderation."